Find delicious ways to make the most of seasonal grapefruit—from shortbread to salads to beurre blanc. Grapefruit are forever associated with diets in many minds. Half a grapefruit and a cup of black coffee has been a classic dieter’s breakfast through all kinds of nutrition and diet fads. The thing is, half a grapefruit at breakfast is a fabulous thing. Perhaps a drizzle of honey or agave syrup on a less sweet variety to counter its tart and slightly bitter nature. Or, get fancy, and make a quick baked ruby red grapefruit topped with orange marmalade and cinnamon to add sweetness and a new flavor, although a sprinkle of brown sugar and few minutes under a broiler does a good job, too. If you’ve planned ahead, you can spread some grapefruit papaya preserves on your toast, too. Next up on the simple scale is to add slices or sections (known as “supremes” when you bother to cut them out of their membranes) of fresh, ripe grapefruit to a salad. 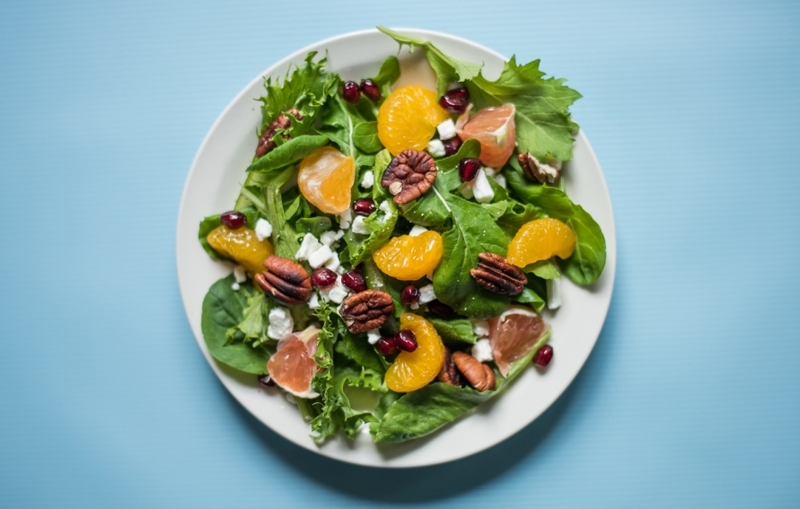 Just toss them in a tossed green salad, if you like, or kick that up a notch with a grapefruit arugula salad with goat cheese for a creamy note and pecans for crunch or a Bibb winter citrus salad with avocado for a beautiful range of color on a single plate. An endive citrus salad is simple but effective, with the chicory and grapefruit knocking down each other’s relatively bitter edge. If you crave a new way to serve kale salad, this grapefruit kale salad features a fresh jalapeño for heat and brightly colored watermelon radish for crunch. Grapefruit salad don’t need to feature greens. For a simple but stunning combination, try this fennel grapefruit salad—it’s those two ingredients plus a bit of olive oil and salt. Yum. A bit more effort yields a winter caprese made with beets, grapefruit, mozzarella, and the total surprise of a touch of cardamom. Sweet beets and bright grapefruit also work well together in this grapefruit beet salad that includes a bit of heat from chili powder and the option to smooth things out with a few slices of optional avocado. Grapefruit thyme beurre blanc is another great example of harnassing grapefruit’s unique edge in a savory dish. This sauce is quick and easy to make and livens up dishes that are otherwise a bit plain—a roasted chicken breast or a filet of sole. The tart-bitter-citrus note that is grapefruit is popular in drinks. A few non-alcoholic options beyond a simple glass of fresh grapefruit juice, include making grapefruit rosemary shrub or grapefruit basil shrub. For those who are a bit more adventurous, here’s how you make homemade grapefruit kombucha. Another grapefruit project is to take on homemade grapefruit bitters (or these spiced grapefruit bitters with clove). Once you have the bitters, they are delicious dashed into a glass of soda water for a mocktail, or in any cocktails that use bitters. Or try a sea dog featuring gin or a running mate with bourbon and egg white. Cocktails made with fresh grapefruit juice can be wicked refreshing, such as this sparkling grapefruit cocktail or this aptly named refreshed Negroni. An Italian greyhound is made with sweet vermouth to be less tart than its classic counterpart. Or just go ahead and use a wedge of fresh grapefruit to add a bit of tang to a rose gin & tonic. The tart acidic kick of grapefruit is also excellent in desserts, adding a brightness to counter richness and sweetness. This grapefruit fennel pollen shortbread has a sophisticated edge, perfect with the finest of teas or sherrys. For something a bit homier, this grapefruit yogurt cake has a lot of zing. If you have company coming, go ahead and put in the extra effort to make a white chocolate pound cake with candied grapefruit and grapefruit caramel. We also love this elegant option: Grapefruit pavlova with pomegranate. Stunningly beautiful with bright colors against white meringue. If things are warming up where you are, use grapefruit to create cooling treats like grapefruit sherbert and grapefruit mint popsicles. The tartness of grapefruit adds an extra cooling vibe.